The real genius of the crock pot (and my favorite slow cooker recipes). In Food & Recipes, House & Home, My Life, Time Management. A few months ago, I shared a list of the things that are saving my life right now in the newsletter. My crock pot was one of them. I resolved to use it more this year, not as an aspirational goal but because I felt like I needed to. This year it’s more than a kitchen appliance for me: it’s a sanity saver. I generally enjoy cooking. Will and I often pour a glass of wine and debrief the day while we’re making dinner together. But there are plenty of days when, for one reason or another, that’s not an option. Like last night, the kids and I got home at 4:30 and I had to leave for a meeting at 6:00. If I hadn’t put dinner in the crock pot at 8:00 a.m., I would have been frantic to get everything done. But when we got home, dinner was cheerfully cooking away. So we took the dog for a walk, and got some fresh air and Vitamin D before the sun went down. Then we sat down to a hot (if short) meal together before I had to leave. Other days while dinner is cooking in the crock pot I might drink a cup of tea and read a good book, one of my favorite things to do on cold winter afternoons. Or I might spend an hour writing: late afternoon is good “thinking time” for me. 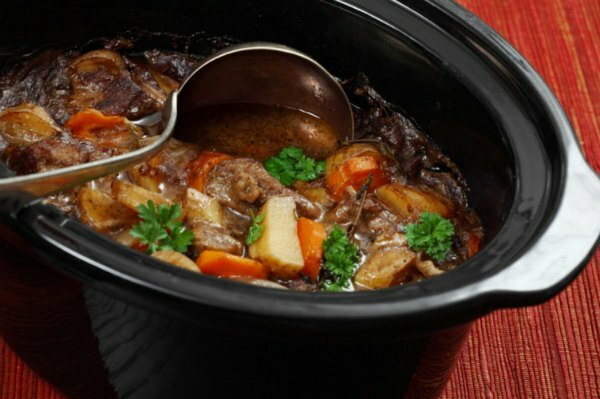 Please share your favorite crock pot recipes (I need more!) and any and all sanity-saving tips in comments. 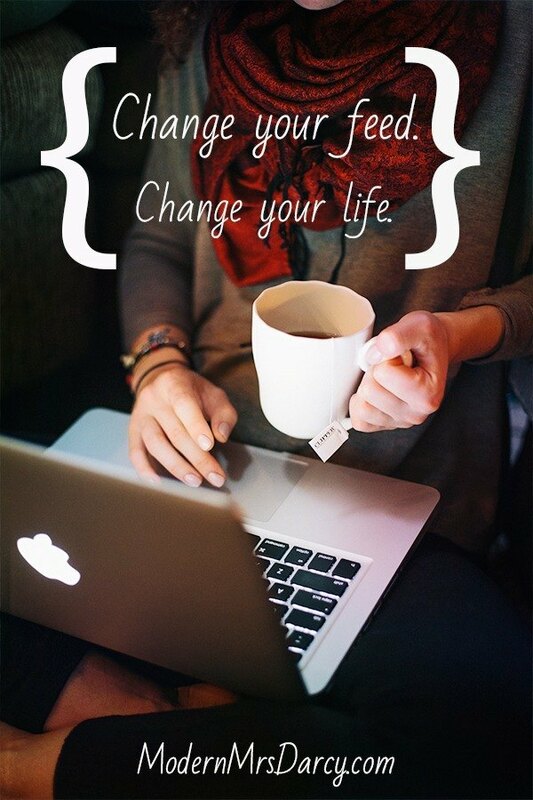 Previous: Change your feed reader, change your life. Next:Links I love and what I’m reading this week. I don’t use my slow cooker nearly as much as I should. Always trying to do dinner at the same time my 4th grader is attempting to do her math homework. Not good planning on my part! My favorite recipes for the slow cooker are vegan, like me. One is from the old Peas and Thank you blog, or from the cookbook. It’s a spicy African peanut stew. It’s made from lentils, chickpeas, fire roasted tomatoes, coconut milk, a little peanut butter, carrots, sweet potatoes and delicious spices. The second is something I found on Pinterest from Thrifty Below. Black beans, corn, tomatoes, taco seasoning, colorful peppers, onions, a little nutritional yeast for creaminess and brown rice cooked in a slow cooker. You can use it as a yummy burrito filling. What a great list of recipes! Thanks so much for including my balsamic beef! I’m honored! I’ve never tried this…! Would you please tell me more? Do you simply plop the chicken into the crock and turn it on? And how long does it take to cook? …Thanks in advance for your advice! Yes! I plop it in with seasoning and cook on low for 6 hours. I have also used a bit of olive oil, but the juices from the chicken are usually enough to keep it moist. Easiest way I’ve found to make a whole chicken! Hope it works well for you! I’m not a huge fan of crockpot food in general, but I’ve been using it more in the past month or two. My main problem is that unless you are making a soup or a roast, lots of things dry out. Especially when you work outside the home and are away from the house for 9-10 hrs a day. I’ve been experimenting more lately though, and have found some things that work for me. I was working from home the other day and made this: http://chewnibblenosh.com/2013/02/15/slow-cooker-tortellini-and-sausage-soup/. Mine came out more of a regular pasta dish than soup b/c I added less broth and tomatoes, but I was very impressed that I was able to just dump it in and it came out so yummy. We got a Dutch oven for Christmas, and I like it more than the crock pot too — but the problem is that it’s usually a 2-hour process right before dinner. So, fine for slow weekend afternoons, and I try to make enough for leftovers to eat during the week. I, too, am hoping to find some more crock pot recipes that don’t result in mush or something dried out and gummy. I love my dutch oven, but have the same issue: even if dinner is easy to prep, that’s not something I want to do at 3:00, or am even at home to do. I used to also have the problem with being away from home for 12-13 hours a day and finding that it created problems for crock pot recipes. Then I bought a $5 appliance timer (the kind you use for Christmas lights) – problem solved! Just set the timer for when you want it to turn on/run, plug the timer into the outlet and the crock pot into the timer. It auto-starts when you want it to, and you’ve got a hot, but not overcooked, meal waiting when you get home! I very much like the quote about moving dinner prep from a busy time to a more convenient one – I find that casseroles (and casserole-like dishes) are the other best way to do that. They’re easy to make in large batches, freeze well, take seconds to pop into the oven at dinner time, and require no side dishes or other fuss. I have the same problem. What a great idea! I’m trying the timer. Good thoughts. Thanks for the links! It is *so* satisfying to come home to dinner already cooked (or almost cooked). Once I know my crock pot, I feel better about dinner being in it. Once, I used a different, bigger crock pot we had been given, and it didn’t work as well as our other one = dinner not ready for my parents when I wanted it to be. I wish my crock pot had a warming function or timer on it- maybe a plug in timer is the way to go! ^^ I’ll have to check that out. I’m completely clueless about Dutch ovens. I need Dutch ovens 101. 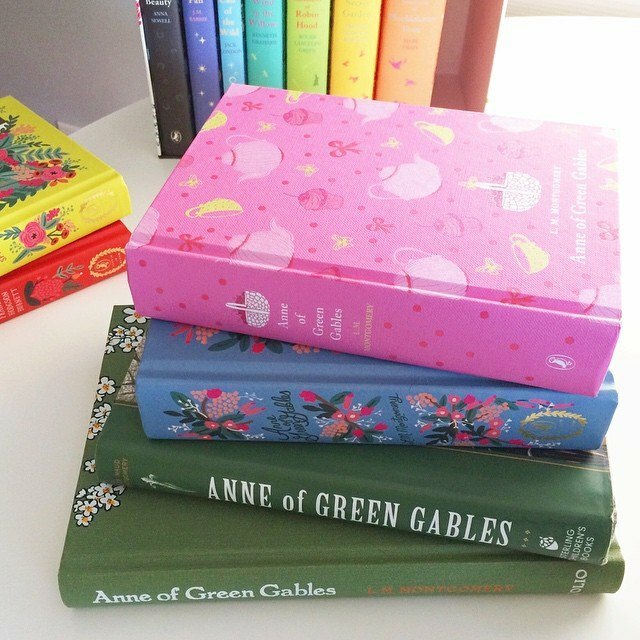 🙂 Thanks for the post, Anne! Thank you for this blog post! I am a full-time grad. student and I just received a crock pot for Christmas! School starts next week, so this blog post came just in time! Looking forward to trying out some of these recipes! Timely post, I used my slow cooker yesterday to cook lamb shanks with veggies and it was so GOOD. I should use my slow cooker more, but quite often I forget about it. What’s also good in the slow cooker is chili (lots of beans for protein), and chicken breasts with taco or fajita seasoning to shred later for chicken tacos. Both are stand-bys for us in the winter. Thanks for sharing these! To be honest, I do struggle with crock-pot dinners (often they turn out gloppy or overcooked/dry), but I love the idea of them. I will persist and try these recipes you shared — they look delish! Thanks for the follow up post! Since you were so interested in figuring out crock pot meals I went ahead a checked out a bazillion cookbooks from the library last fall to try new things in my crockpot. The salsa verde beef was a huge hit and I really enjoyed Jessica Fisher’s freeze ahead cookbook in my search. We also adore the copycat Chipotle barbacoa recipe found online. Our traditional New Year’s Day good luck meal has always been made in the crockpot: PA Deutsch pork and sauerkraut. Agreed, I never appreciated the crockpot until having kids! They are turning gremlin right as I’m thinking about dinner–bad combo. That beef stew looks amazing! I was planning to do a slow cooker beef stew for Sunday night dinner, may try this recipe out. I adore my slow cooker. Between work, homeschooling, and outside activities, it has saved my sanity many a time. It took out my link! Loving these comments! We love our slow cooker and use it at least 2 times per week. I work from home and it’s easier for me to get dinner ready as I’m fixing my lunch. We enjoy very simple recipes. Our favorite is just putting chicken breasts in the crockpot with taco seasoning and water, BBQ sauce, or Trader Joe’s Soyaki sauce. I also love a beef stew. Have you ever done baked potatoes in the slow cooker? Just wash the potatoes and throw them in there. We love them that way. It’s easy to get some toppings together and everyone can customize their own potatoes. The sweet, deep sauce is just wonderful. I love your thoughts, too, and echo them. Mid-mornings are a way better time to cook dinner than the witching hour for me, when little people are grumpy and screaming around my feet. Thanks for including my Salsa Verde Beef. I’m including it in a Whole 30 meal plan I’m working on. Can’t wait to have it again! Oh, fun! I have one of their slow cooker books and I really like it. Great post! Love the crock pot and the dutch oven. Wintertime cooking is so satisfying. Here are some that we eat pretty regularly. -Easy BBQ version of above – pork, water, s &p and an onion. Add your favorite BBQ sauce when it’s done. The BBQ sauce makes or breaks it, so choose wisely. -I also do a big pot of beans in the crock pot periodically for beans and cornbread (cowboy/cowgirl dinner). Leftovers are great to freeze or use for quesadillas and such. Overnight oatmeal is fun. I want to try caramelized onions. Oh, and I almost forgot my VERY favorite one! I don’t really follow a recipe for it–just a pork roast, with 1 cup each of green salsa and brown sugar. Best ever sweet pork for tacos or salads or whatever you like. Yum. That pork one sounds yummy! I’ve really come to love the crock pot with our busy brood. Moving the prep time for dinner to the morning (thank you, crockpot!) has saved me too many times to count! That chocolate chili recipe is one of our favorites. Last night we made Chicken Enchilada Stew. It gets rave reviews from my kiddos, save the four year-old who won’t eat anything. The kids have it with cheese and chips; my husband and I top it with avocado and cilantro. Yum! I just made chili in our crock pot yesterday! It is very nice because I get a break during the 5 o’ clock hour instead of having to cook. I use my CrockPot at least 2-3 times per week. I also just recently posted a list of my Top 20 CrockPot meals (all of which I’ve made and enjoyed multiple times). I’m sure you’ll be able to find something you like! Cook on high all day. 1 hour before serving salt to taste. I use about 2 TBL of Salt for an entire 5 cup crock pot. meal Planning is my issue. about a month ago i joined http://www.plantoeat.com I am in love. The first two weeks I just put down what we had for dinner and then put the recipe in the recipe area. Then last week I actually planned what we were eating all week. To often in the past I would plan menu then only stick to it a day or two because it was all new recipes. I like that this lets me plan then makes up a grocery list for me. I can then walk into the kitchen and cross off everything I have. We are only a family of two but it is working great for us. With the New Years resolution to cut down on carbs this has been a great option for us. I used to love cooking in m crockpot – beef stew, chicken and dumplings, salsa chicken. Bu since rest of my family went vegetarian, the crockpot sits on the top of the fridge getting dusty. The few veggie recipes I have tried have not been a success. I am thinking about donating it. A few years ago when I got a slowcooker for Christmas I was hmm..not 100% excited. Now, i use it all th time! Pop things in, forget about tchem for a few hours, enjoy your effortless dinner! Agreed on the crockpot helping the evening craziness! I like to make BBQ chicken – chicken breasts with brown sugar, Worcestershire, thousand island and BBQ sauce. I made the balsamic roast beef this weekend and it was great. The leftovers make an awesome topping for nachos. Thanks for the recommendation. The pulled pork recipe sounds amazing, but the recipe in the link is for oven/grilling. How did you adapt it to work in your crock pot? I just put it in the crock pot instead of the oven. In mine that takes about 8 hours on low. I’ve done it many times. It doesn’t hurt that pork shoulders are very forgiving when it comes to how you cook them. Oh gosh, so many favorite crock pot recipes! But here are the ones I have made about a dozen times.